Developments in the US related to the election of Donald Trump and its expected effect on the US monetary policy path and international trade introduce significant uncertainty for emerging market economies (EMEs) in 2017. Fiscal stimulus suggests a faster-than-expected monetary policy normalisation cycle, causing capital outflows and tighter financing conditions in markets like Turkey, South Africa, and Argentina. Higher US GDP growth in 2017 could spill over into some trade partners, especially those exporting commodities used as infrastructure inputs. A move to protectionism would lower medium-term growth in EMEs with close trade ties to the US. Emerging markets are on high alert following the election of Donald Trump as President of the United States. This has inflated uncertainty about the 2017 global outlook, primarily through interest rate and trade channels. While the policy agenda of the Trump presidency remains unclear, two of his pledges could have significant impacts: fiscal stimulus and protectionism. Spill-overs into EMEs would be most acute through the interest rate channel as US rates could increase more quickly than previously anticipated and through the trade channel. As anticipated, the Federal Reserve (US central bank, Fed) has increased interest rates in its December meeting. Markets had already priced this in after persistently robust inflation and labour market data, so financial crises in EMEs, as those experienced in past episodes of US monetary tightening, are unlikely. However, the predicted path of US monetary policy normalisation has now changed following the election of Donald Trump. The Fed is now expected to continue increasing interest rates at a faster pace due to the expected fiscal stimulus – potentially Mr Trump’s first agenda item. The scope of tax cuts and infrastructure investment is uncertain due to possible challenges from fiscal hawks in Congress but bipartisan support and vocal commitments by Mr Trump offer confidence that it will occur. The pursuit of such a programme would put upward pressure on prices and GDP growth. To manage inflation and avoid overheating, the Fed would need to increase interest rates. 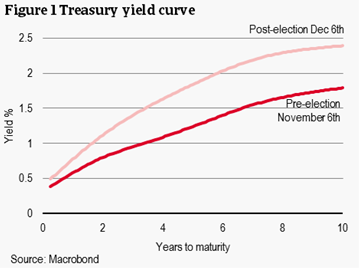 Accordingly, international investors have been adjusting their expectations for inflation and interest rates, as is evidenced by the US yield curve (see Figure 1). Higher bond yields in the US and the safe haven aspect of US government bonds make riskier emerging market assets less attractive. They also make it more expensive for borrowers in EMEs to refinance their debt. As such, financing conditions in EMEs have already tightened. The new anticipated Fed rate hike path could exacerbate this risk for emerging markets that are vulnerable to international capital flows and have high, foreign currency-denominated debt burdens. A reversal of the search for yield experienced in 2016 would drive capital away from EMEs, causing currency depreciations, as presented in Figure 2. Depreciating exchange rates increase funding risks of companies and governments in these countries since debt is often denominated in foreign currency and they depend on short-term financing. This also puts upward pressure on price inflation, forcing their central banks to increase interest rates. The countries most vulnerable to these developments are Turkey, South Africa and Argentina, as presented in Table 1. Higher US interest rates and currency depreciations would put pressure on countries holding large USD-denominated debt burdens and facing consistent external financing requirements, making financing more expensive. Ineffective monetary policy would also contribute to lower confidence and fail to stem capital outflows, exacerbating the problem. Turkey is particularly vulnerable due to its high share of foreign currency-denominated debt and political risk. On the other hand, countries like Russia, India and Thailand are less exposed to the Trump effect on US monetary policy since they have relatively low financing needs in 2017 and are less dependent on volatile portfolio investments. Countries with currencies fixed to the US dollar, that cannot use their currencies to absorb external shocks, generally follow the decisions of the Fed, adapting policy rates to their US counterparts to reduce pressure on the peg. Interest rate differentials are thus minimised and capital inflows tend to increase as higher yields increase the attractiveness. Hong Kong and Arab countries of the Gulf Cooperation Council (GCC) are examples of central banks mirroring Fed decisions (with the exception of Oman and Qatar in December 2015). These countries are expected to follow the current US tightening cycle path to prevent reserves from shrinking and reduce pressure on their pegs. Countries are also directly affected by the results of the US election and potentially hawkish Fed policy through the trade channel. Higher US policy rates would strengthen the US dollar – the effect of which could be twofold. On the one hand it increases domestic purchasing power and thus demand for imports. This is further helped by stronger GDP growth and higher investment (lower savings) rates. These would all contribute to a widening current account deficit in the US and boost growth in trade partners as well. 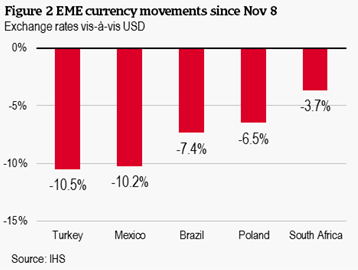 On the other hand, the stronger dollar would weigh on EME trade balances. Weaker domestic currencies could decrease trade partners’ export revenues while also increasing import costs in local currency. President-elect Trump’s plans for large-scale infrastructure investment could also be beneficial for countries exporting commodities, especially construction inputs like iron and steel. Emerging markets, especially in Sub-Saharan Africa (i.e. Sierra Leone, Zambia) and Latin America (i.e. Chile, Peru), could see export revenues increase due to the high share of ores & metals exports in total exports. However, the effect of sustained US demand on prices would only be small given the limited share of global demand for these commodities held by the US (2% of global iron ore imports and 7% of global steel imports, compared to 66% and 42% for China respectively). But this would likely only be felt in the short term as unorthodox, protectionist measures coming into play would erode US demand for imports. Mexico and China in particular have been targeted by Mr Trump and could suffer from targeted tariffs. In general, countries that export the most to the US would be hit the hardest: Mexico and Canada are both top exporters as a share of both GDP and exports. Anti-immigration policies could also depress current accounts further in countries like Mexico which would face lower remittances. A closer look shows the implications of the Trump presidency on the economic outlook for emerging markets are mixed; however, the downsides clearly outweigh the upsides. The reversal of capital into the US could increase capital flows into EMEs with exchange rates pegged to the USD but could pull them out of those with floating exchange rates and low external buffers. The stronger USD, coupled with higher investment in the US, could increase demand for imports from trade partners. However, weaker domestic currencies would cause export revenues to decrease and USD debt burdens to increase. Commodity exporters could benefit from higher prices stemming from US demand but the total US market share for imports of commodities is quite small. Higher protectionism though would have increasingly negative effects for US trade partners.